Employers have so much to keep track of now days. With changes in technology, it is even more important that they keep up to date on all telephone calls coming into the business or going out. 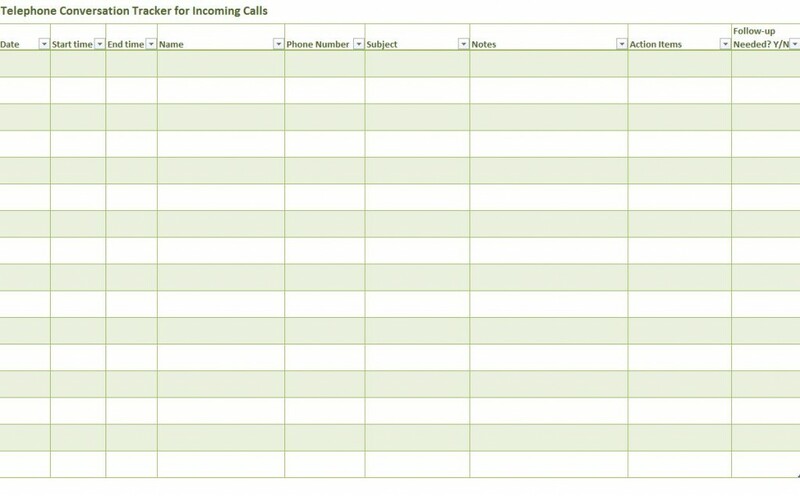 A telephone conversation tracker template is the ideal way to keep track of important calls for many different purposes. The uses of a Telephone Conversation Tracker are beneficial to the user for numerous reasons. You can keep track of potential leads, concise records of client calls, simplify referencing calls of any kind, and having a secure system in which to monitor telephone use. Such benefits are invaluable. The Telephone Conversation Tracker template we offer is organized by sections and is easy to understand. Such simplicity enables the user to track incoming and outgoing callers, their names, dates, nature of business, and how the call was dealt with or dispatched. Not only is it easy to use, but we also offer the downloadable free template right here for your use. The templates are customizable for your business and its individual needs. As stated, the Telephone Conversation Tracker template is extremely easy to use, navigate, and record with. It is self-explanatory, and you should find it to be trouble free. It important to use the Telephone Conversation Tracker template in a consistent fashion for your business to get ideal use and performance possible. Without the use of the product, it can not suit your needs. Be thorough in reference to the call; make sure you have the correct date. Be sure to verify all information: name, return phone number, nature of the call, and any extra notes to be written. When you customize your template, are able to set it up as needed. It is important to be exact when customizing, leaving out nothing you may need. Deeply consider your businesses needs first.